Simple car control by webpage with an awesome Knight Rider effect! In this tutorial, I will show you how to build a simple Wemos NodeMCU, or other ESP-based, car system. Over the course of it, I will use the term Arduino for this device. 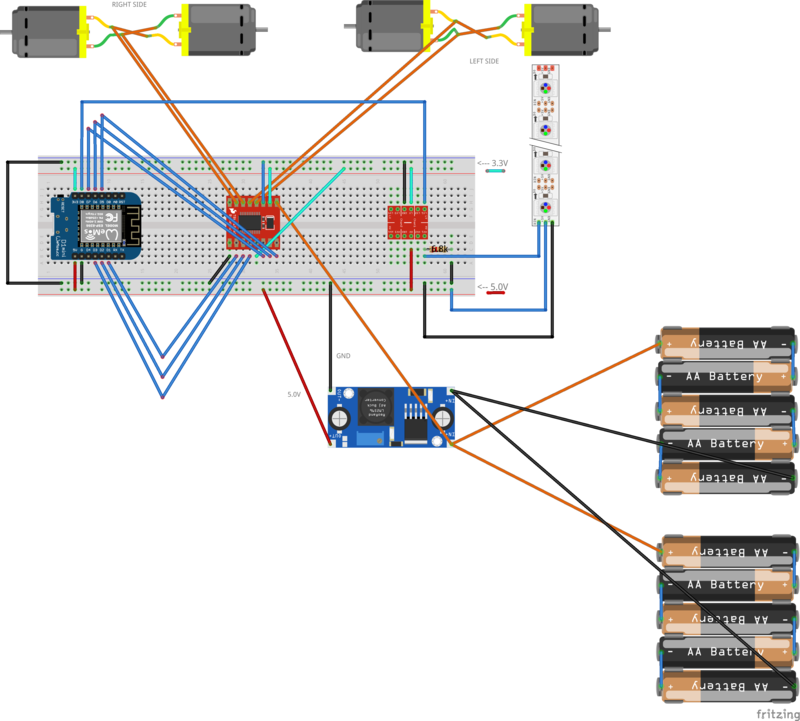 Before starting the course, I suggest you read the articles “quick start” for both the website and Arduino. We start with assembling the robot chassis. Engines on the right and left side are connected to each other and we supply the power cable to both at once. It is important that after powering up the engines spin in the same direction, the wheels on the right side always spin in the same direction, the same on the left side of the car. At the beginning do not hook the converter, bridge and wemos. Only after setting the inverter, check that the voltage is exactly 5v on the board. Above setting of outputs. and frequency setting analogWriteFreq (1000); (as 100 will be the engines will “jump”). The same function is for the second engine. More about constants and how to supplement them here. Of course, before uploading and completing the token, you must have an account at remoteme.org. After uploading, our arduino will appear on our device manager. Before testing, put the car in such a way that it is stable and none of the wheels touches the ground! Play with the control of lights on your own. Of course, we will not control the car in this way. we will make a website that will send similar messages. We have 3 options: rewrite this long URL to a mobile phone, 2 copy and send to a mobile phone, 3 or generate a QR code and scan the phone. To change the light effect, select the effect from the drop-down menu at the bottom left. by changing the position lines L1 and L2 – and in places X and / or Y add minus. remoteme.sendUserMessageByFasterChannel (arduinoDeviceId, ret); – we send a message to arduino. As always, I recommend fanpage on FB https://www.facebook.com/remoteMe.org/ where I throw information about the project, future courses.